That same simplicity extends to the WAND system in day-to-day use, mostly due to an app that's minimalist in nature, without much to navigate. Poke a speaker in the app's main UI, and you can select a source, should you wish to stream via a physical connection or Bluetooth. Tap the gear symbol next to each speaker's name, and you can change the audio mode, as detailed above. As for audio performance? Well, let's talk some nerdy specifics really quick, then dig into subjective impressions. As you probably gathered on your own, the Festival is the more full-range of the two speakers, with plenty of usable bass extension into the 50s and an admirably flat magnitude response, with just a bit of a boost in the 100- to 150-Hz range. The Arena, by comparison, doesn't reach quite as deep, running out of steam pretty quickly below 60 Hz, and there's a pretty noteworthy dip in the low 100s that, combined with a general decline in response above 1 kHz or so, gives the smaller speaker a somewhat chestier, midrange-forward sonic profile. That's relative to the Festival, mind you. Taken on its own terms, the Arena is pretty surprisingly neutral for such a small speaker. Both speakers also deliver plenty of usable energy up to the point where my upper-frequency hearing runs out of steam near 17 kHz. All in all, these are very respectable capabilities for a couple of speakers that will, in most homes, be used primarily for casual background listening. In fact, the types of music that you'll likely find streaming in a casual, background sort of way are exactly the types of music with which both of these speakers excel. Songs like "Listen to the Music" from The Doobie Brothers' Toulouse Street (Warner Bros.) make both the Arena and Festival sit up and sing. From the opening guitar riff to the jug-band jam that quickly follows--and just as quickly fills the room--there's a wonderful, effortless sparkle that makes both the Festival and Arena downright fun to listen to. Granted, the larger Festival takes the edge in both output and neutrality, but I was surprised as I walked back and forth between the rooms in which these speakers resided just how smooth the handoff was from one to the other. The little Arena truly holds its own, especially in its ability to fill a space with sound. With this track, the only significant difference I noticed between them (aside from sheer output) was a slight bit of chestiness in Tom Johnston's voice when coming from the smaller Arena. Interestingly, I couldn't help but notice that both speakers did play some tricks with the mix. The initial guitar riff I mentioned above? If you've ever listened to the song on a hi-fi setup or a good set of cans, you know that it comes from the right channel pretty much exclusively, and when the rest of the instruments join in the mix expands leftward. Through both the Festival and Arena, this isn't the case. The guitar starts right in the middle of the speaker and the mix expands outward as it thickens. It absolutely makes sense given the purposes for which the speakers are built, and it's a neat effect, no doubt. Is it "correct"? No, it's not. But there's no way that any method of delivering room-filling sound from a single speaker cabinet is going to result in a correct soundstage. What RIVA has managed to do here, and admirably so, is maintain the mix's spaciousness without being slavish to the mix's exact balance in the original recording. There's a similar effect with "One Rainy Wish" from The Jimi Hendrix Experience's second album, Axis: Bold as Love (Reprise). In this case, a proper stereo mix of the song shoves Hendrix's vocals pretty much all the way into the left channel. Both the Arena and Festival preserve the general direction of that hard pan, but they turn it more into a gentle leaning. Jimi's voice sounds like it's coming ever-so-slightly more from the left side of the room ... but only ever-so-slightly. More importantly, though, both speakers maintain the overall tonal balance of the mix beautifully--capturing the inimitable tones of Jimi's guitar and voice with near perfection, delivering Mitch Mitchell's high-hat-heavy percussion with both the subtlety and authority it deserves, and drawing out all of the nuance and richness of Noel Redding's bassline. Here, I'd say the biggest difference between the Festival and the Arena is overall spaciousness, with the smaller Arena feeling slightly but noticeably constricted. Again, the difference is not so pronounced that walking between the rooms that house each speaker was at all jarring. The one song where I did notice a pretty big difference in overall tonal balance was "Africa" from Toto IV (Columbia). Here, David Paich's vocals definitely take a more forward position in the mix via the Festival than they do via the Arena. This balances out once Bobby Kimball takes over chorus vocals, though, and it's really difficult to fault either speaker's delivery of the track's oh-so-eighties mix of marimbas and synths. There's just a wonderfully fun poppiness to it all, and as such I found myself drawn into (and unable to resist singing along with) the music in a way that's rarely the case with smaller wireless speakers. Much the same could be said for Steely Dan's "Peg" from Aja (MCA Records), which just downright dances out of both the Arena and Festival. The larger speaker naturally has the edge in terms of pure output, but the way in which both speakers manage to keep up with the density and dynamics of the mix is rather startling. Another favorite aspect of their performance is the way that Michael McDonald's backup vocals explode out of the cabinets toward every corner of the room. Digging over the notes I made while listening to this track, in particular, I see the word "fun!" written over and over again, underlined, and accompanied by a pornographic number of exclamation marks. So, yeah, I'd say that just about sums it up. Of course, designing a small, portable music system of this nature is going to involve some compromises here and there. For the most part, I'm fully onboard with the compromises that RIVA has made, given that they result in wonderful delivery of the sorts of tunes that I'm most likely to crank through a system like this. Almost without exception, yacht rock, classic rock, and the sort of singer-songwritery stuff that I tend to keep on in the background just sound fantastic through either of these speakers. In very rare circumstances, however, I came across songs that by all rights ought to sound amazing through the Arena and Festial but for some odd reason just didn't. Pure Prairie League's "Aime" is a prime example, especially in the way the DSP limiters straight-up swallow the song's bassline completely. Which is weird, because any number of other tracks with deeper, more powerful bass came through just fine. But the bottom end for "Aime" disappears here--oddly, even more egregiously through the larger Festival than the smaller Arena. Maybe it has something to do with the attack of the bass? Honestly, I'm just guessing. But for whatever reason, it's peculiar. Weird DSP quirks like that are thankfully rare. So, too, is the occasional app weirdness, which sometimes manifests in the form of crashing or an inability to select Chromecast speaker groups. Other than those rare inconveniences, I found both of the WAND speakers to perform reliably and predictably, whether using the app, Spotify Connect, or a Bluetooth connection from Amazon Echo Dots in each of the rooms where the RIVA system has resided during the review process. If I had one complaint in terms of functionality, it's that the WAND system seems a little incohesive. By that I mean that it just doesn't have the unifying experience that something like the Sonos app, or to a much lesser degree the MusicCast app, gives you. In form and largely in function (if you ignore its non-monophonic performance), the RIVA WAND Arena bears a striking resemblance to any number of wireless multiroom speakers--namely, the $199.99 Sonos PLAY:1, the $199 HEOS 1, and Yamaha's $199.95 WX-010. However, at $249 (without its $99 add-on battery pack), the Arena is a little more expensive than any of those three. In terms of audio performance, the Arena is probably a closest match to the PLAY:1. In terms of physical connectivity, it's a closer match to the HEOS 1. And when it comes to streaming versatility, the Yamaha is probably a closer competitor. All in all, I find the Arena to be a nice combination of the strengths of all three, although the PLAY:1 has an edge on the RIVA unit in terms of pure tonal balance and system cohesion. It can't quite match the WAND system in terms of flexibility and versatility, though. As for the Festival, its closest competition is no doubt much larger speakers like the $499 Sonos PLAY:5 and even standalone Bluetooth speakers like Peachtree Audio's now-discontinued Deepblue2. Of course, if you're looking to build a multiroom streaming audio system but you want to bring your own speakers to the equation, you could always opt for something like the Sonos CONNECT:AMP or Yamaha WXA-50 MusicCast streaming amplifier instead. At CES 2018, RIVA introduced its own wireless amplifier, the Central, which will let you add your own speakers and audio devices to the WAND ecosystem. It will be available this spring for $399. The bottom line is that, if you're looking for a wireless multiroom audio system, you have a plethora of choices available to you. Although most of them have their unique strengths, you'd be sort of silly to expect any of them to deliver the sort of rich, balanced, room-filling sound you'll get from even a modest component stereo setup. Here's the thing, though: the Riva WAND Arena and especially the Festival come closer than any other combinate single-chassis wireless speakers I've heard in recent memory. Both speakers really sort of perform magic with the types of music that I'm inclined to play in the background: early Chicago, Steely Dan, Hall & Oates, Fleetwood Mac, Christopher Cross ... I could go on and on, but I think you get the point. Unless Skrillex played at 105 dB is your idea of background music, I think you'll agree that both WAND speakers really excel at their intended task. Combine that performance with the versatility provided by so many different supported protocols, not to mention the ability to bring physical sources into the wireless streaming ecosystem so easily via the Festival's optical input, and I'd say RIVA has something pretty special on its hands here. A few improvements to the app, and this system will be a force to reckon with. 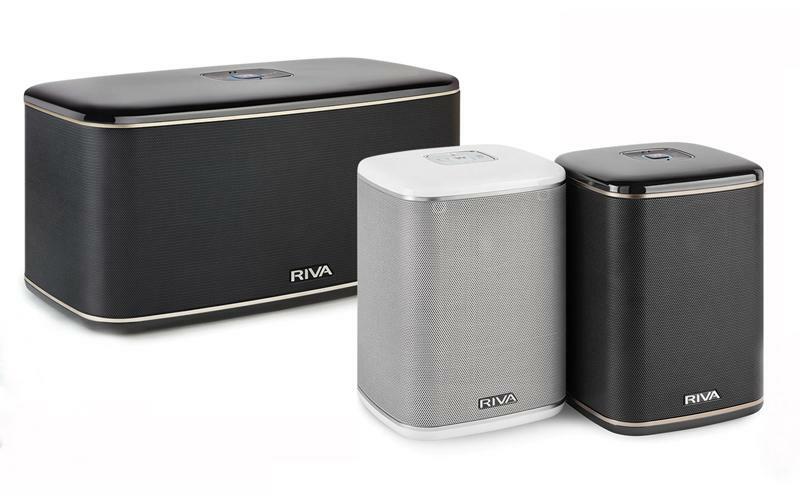 • RIVA Introduces the WAND Tabletop Speaker Series at HomeTheaterReview.com.